You get excellent close- and long-range target detection ranging from as close as 20 feet to 72 nautical miles, even in fog or rain. Its narrow 1.8 degree horizontal beamwidth provides a high-resolution image and high antenna gain so it can pick out weak targets at a distance. 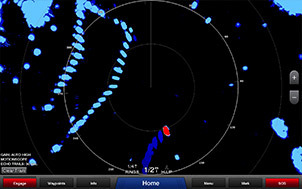 The result is this radar paints a clear, concise image of the shoreline, other vessels and impending weather — right on your Garmin chartplotter. You get consistent target positions, excellent target separation and reliable operation. Its 8-bit true color imagery also helps you discriminate large targets from small ones and enhances target separation. Rotation speed of up to 48 rpm provides fast screen updates.